When I was a writing student, one of my professors said, “Once you find your voice, this story will really shine.” As if, like my house keys, I’d simply misplaced my voice and would find it again somewhere I least expected it like inside the freezer or behind a potted plant. But it’s hard to find something if you don’t know quite what you’re looking for. If you ask five different writers to define writer’s voice, you’re likely to get five different answers. I think it’s difficult to pinpoint because voice is actually a combination of three qualities: style, tone, and perspective. Voice is one reason why no two stories are alike. The writer comes to the page with her particular brand of inflection. You and I can write the exact same story—same plot points, same characters—and our stories would be very different. (Just the fact that I used em dashes in that sentence is one thing that may separate us.) Voice is the intangible thing that makes your writing, your writing. In this case, perspective doesn’t have anything to do with point of view or narration. Your perspective is based on your experiences, beliefs, and way of interacting with the world. (INFJ, anyone?) As you tell a story, this perspective influences your writing. You can draw on it to make characters and story events authentic. This is not to say that you can’t write outside your direct zone of experience. We writers have good imaginations, after all! But you’ll still bring your unique blend to the page. Start paying attention. And, more importantly, pay attention to what you pay attention to. We do a lot of exercises around this in my class The Writer’s Muse: Explorations in Creativity because it helps you zero in on what you’re curious about and how that impacts your story. This can be anything from the brooch an elderly woman has on her collar to a bumblebee hovering around a flower. It can be a snippet of conversation overheard on line at the grocery store. Keep a notebook with you to record some of these observations. Note why you noticed. Did the brooch remind you of something your grandmother had? Are you afraid of bees, or are you fascinated by them? What you notice and why you notice it is your perspective. I find that tone is the most difficult element to describe, but the one I can identify most quickly. Tone is the writer’s attitude toward the story, and it gives the reader a clue about how she should feel about the story events. Mood and tone go hand-in-hand. Your tone can be ironic, thoughtful, humorous, sardonic, witty, etc. Generally you don’t want your tone to be at cross-purposes to the type of story you’re writing. It changes the way the reader interacts with the story. Tone is achieved through a combination of word choices, word order, and sentence construction. Read Like a Writer. 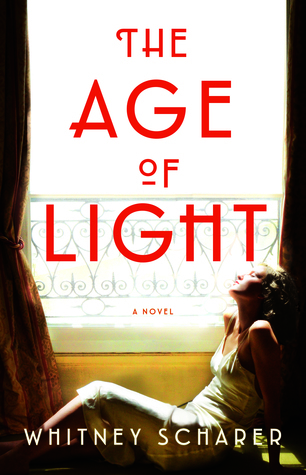 In order to start zeroing in on your tone, go back to some of the novels or memoirs you’ve enjoyed recently. Consider what you value most in this story. High concept? Lush prose? Deep, realistic characters? Twists and turns? Solid morals of all involved? Then think about which characters you connected with. Are they best described as: Edgy? Sarcastic? Slippery? Warm and inviting? Unexpected? Now you have a few clues about your preferences and how you can incorporate those traits into your writing. My Reading Like a Writer e-course offers guidance and tips on how to do this effectively. Imitate. Many writing instructors suggest copying the voice of a writer you admire. This can be a great place to start. Love David Sedaris? Try imitating his wry, gently mocking tone your story or essay. Captivated by The Hate U Give? Write a few chapters in Angie Thomas’s tone. Try it on for size. Writing style is the most elusive of these elements because it isn’t something learned. It’s more about discovery. Style is the rhythm of your words. Your style may be short and to the point. It may be lush, descriptive prose. The best way to learn your style is to write. Copy. When you’re reading and you come across a passage or sentence that you love, copy it. (I have a special notebook for this!) Don’t just highlight it in the book itself. Write it word for word. Ask yourself: Why did it stop you? Is it the lovely description? The way the sentence is ordered? The precise verb choice? Before long, your reading journal will be filled with what you regard as a pleasing style, and you can incorporate the best of these examples in your work. Try Morning Pages. When you write morning pages, you’re less likely to self-edit. Your writing flows and sounds like…you. Over time, morning pages will help cultivate all three elements of your voice: your unique perspective, your style, and your tone. 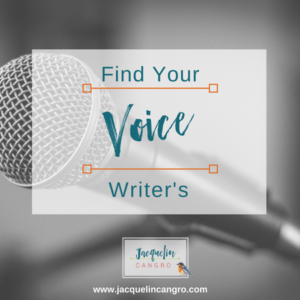 Do you have any suggestions on how to find your writer’s voice? Please share in comments. 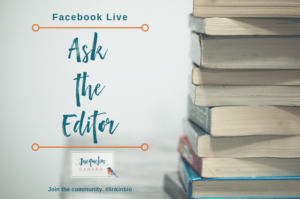 Ask the Editor: A Daily Q&A Session on FB Live. Do you have writing or publishing questions? Here is your chance to get answers. Every day for the month of August, I’m hosting a short FB Live session in our group. Leave your questions in the comments below (or DM me) and I’ll answer them in a future FB Live. All videos will be posted so you can watch later. It’s not too late. Join now and get your questions answered. Well, here you are! Thanks for the informative post . . . and I hope all is well:). You found me! 🙂 I’m so glad you stopped by. I too write favorite lines and passages in a notebook. It’s wonderful to go back and read them, and now I’ll study them more closely to see why I chose each one. Another INFJ here. Less than one percent of us! That’s a great idea, Carole. There is a reason you connected with those passages. It could be the emotional meaning or the beauty of the imagery or the poetry of the word choices. Asking yourself why it resonates may help incorporate it into your own writing. P.S. I didn’t know that INFJs are only 1 percent of the population! Fabulous advice, Jackie. Went through and read your other posts (from your newsletter as well). Really loved the ‘perspective’ article on Write Naked. Thanks for sharing your wealth of information! Thanks so much, Melissa! I’m so glad you found this information helpful.